…by developer Platinum Games on its Flickr account. If you print this out and crayon it in pink, it’ll be like she’s actually naked. Would do it to show you, but haven’t got a printer. Here’s what her torso would look like once you’ve removed the identifying head and fingers. We’re saving this model for 20 years time when 3D printers become available. No one’s going to complain about this being on the internet. We won’t be afraid to open up Hotmail this afternoon. There IS more than one track in it! There’s at least TWO. Hopefully it’ll make it up to the classic minimum SEGA race game requirement of three tracks, plus Mirror Mode, plus Reverse Mode, plus a bonus one for completing the existing three in Normal, Mirror & Reverse. We have declared a new ENEMY! Train2Game, a trading name of Metropolitan International Schools Ltd, is not happy about this and this in which the usefulness and sales practices of its get-a-job-in-games courses were questioned by several UKR readers. It has complained to YouTube and had the videos pulled, now it has sent us a legal letter demanding our updates are taken down. No one said PLEASE. Had it asked nicely we perhaps may have complied. We are sometimes capable of basic human kindness. Sadly, we now have to inform Train2Game that because it did not say please a state of ENEMIES now exists between UK Resistance, Train2Game and all associated subsidiaries of Metropolitan International Schools Ltd. This is very exciting. We can only hope that news of this legal threat doesn’t cause more damage to Train2Game’s battered reputation. Kindly old Bruce has already outed them, twice in fact, pointing out that they tried to sue Google (! ), plus the Advertising Standards Agency has upheld complaints about the parent company’s practices before. You know a company is a bit odd when it tries to shut down Google. Would you want to give money to an operation that tries to hide opinions of its customers from the public? We can only hope this page doesn’t go on to feature highly in Google’s search rankings when people research Train2Game in future! Even posts on Train2Games’ official forum question the course’s usefulness, the bizarre £5k-upfront loan scheme it offers, the ownership of the operation and the difficulty of cancelling a course. And those are the officially sanctioned posts – imagine what the ones they delete must be like. Tony, the reason everyone on the internet thinks T2G is a “scam” is because you try to censor search engine results and force sites and forums to delete valid debates. It’s pretty simple. Train2Game is clearly unaware of the SCARS WE BEAR. We would rather crash our ship into their ship wiping both of us out than surrender as directed. The self-destruct procedure has been initiated. Riker is being very brave about it, although Deanna looks like she might be about to start crying. If the MD of Train2Game sends us a polite email asking nicely for the updates to be taken down along with a photo of him doing a “thumbs up” in front of a screen showing UK Resistance to put in their place, we will be happy to comply and remove the pages. Sorry this is such a boring company to declare enemies on, but they did start it. HAVE A STORY ABOUT T2G? Please let us know. We’ll compile a Word document and put it in with the black box flight data recorder to be recovered after the detonation. That’s right, Mickey, kill the monster and steal the laptop it drops, then pawn that in and spend the money on a new mobile phone. Got bored of playing this sort of thing on the Saturn. NEXT PLEASE. Number of days since last played a video game: 207. Bizarre concept made entertaining by the animated video in which video game versions of Tiger Woods, that man who’s good at tennis and another man who might be Thierry Henry but it’s hard to say as football’s for idiots, COME ALIVE and WALK OUT OF THEIR SCREENS to admire the razor. Submitted ages ago by “Courtser”. Thanks, Courtster. On days like this it’s nice to have links to things that were on Joystiq several months ago to fall back on. And how can they make it even clearer that the product is for gamers? A controller on the loading screen. Some men have decided to create a Weirdo Directory, full of photographs of people for whom trousers and jumpers simply won’t do unless they are SHINY SPACE TROUSERS THAT DON’T FIT and jumpers with BITS MISSING because they’ve just had a LEVEL 200 FIGHT. That’s Rob, Kez and Peter. Not sure which one is Rob and which one is Peter, but Kez is the one using the pretend name so people like us can’t find her on the internet to ask for MORE PICTURES OF YOUR SHOES. From the book. The book has web sites. Good luck, book. Good luck, girl. Just remember, it may seem cool to lose your virginity to a 45-year-old man dressed like a wolf in a London Travelodge, but in 20 years time you’ll wish it was a bit more of a special moment. Please stop emailing this in now. No we don’t smoke, but yes, we do like setting fire to things. Countryside hedgerows and the hair of women sitting in front of you on buses go up the best. Hedgerows burn nicest on crisp, dry autumn days, while hair is best freshly washed with a generous coating of hair spray to aid ignition. We are only joking about the hair. No one ever sees the funny side of that. Hedgerows, however, are highly recommended. Proper facts available on a proper web site. Better photos here. IS IT POSSIBLE TO BE AROUSED WHILE THINKING ABOUT SICK CHILDREN? Like Christina Aguilera in ‘Genie in a Bottle’, our body is saying LET’S GO, but our heart is saying NO – IT’S FOR SICK CHILDREN. YOU CAN’T GET AN ERECTION OVER LIZ MCLARNON’S SHOES BECAUSE IT’S A CHARITY GAMING EVENT FOR SICK CHILDREN. Sent in by “Lewie”. Lewie said there would be “something comically tragic about playing Zuma’s Revenge with Sooty and Sweep” but we haven’t played Zuma’s Revenge so don’t know if that’s a good thing to say or not. Left half of brain can concentrate on Liz’s lovely shoes [SCROLL DOWN! ], while the right half of the brain can think about sick children and how lucky we all are not to be in hospital under heavy sedation looking at drawings of Disney characters on the ceiling while waiting for a compatible liver to become available. She just met him in a pub, and now they’re sharing a taxi home a mere 45 minutes later? The dirty cow. Nice shoes. Specialist shoes. She would be more than welcome to inflict some serious damage to our scrotums with those heels. Here’s the press release including the list of, er, motorway service stations where Liz will be appearing. Singer and former Atomic Kitten turned celebrity chef Liz McClarnon was at Tower Bridge, London yesterday to cuddle up with Pudsey Bear for the launch of the PopCap Celebrity Play-offs in association with Welcome Break – a national fundraising tour in aid of BBC Children in Need 2009. 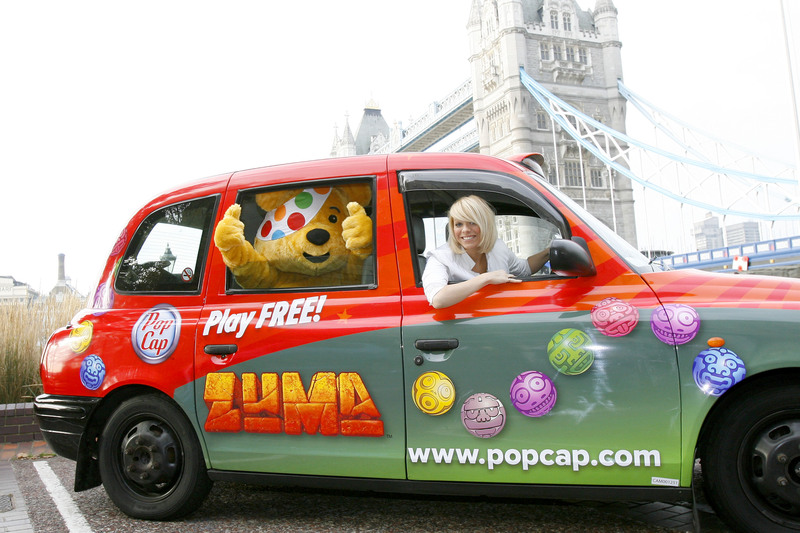 Liz and Pudsey climbed aboard an iconic London cab to get the UK tour on the road. The PopCap Celebrity Play-offs tour will get the nation gaming with a fun-packed party bus, which will roll into Welcome Break locations nationally. On board, Pudsey will be joined by celebrities who will challenge members of the great British public to beat their score on the latest hit game from PopCap.com, Zuma’s Revenge! – while also raising valuable funds for BBC Children in Need 2009. Hopping aboard from Sunday 25 October to Sunday 1 November to try their luck in the PopCap Celebrity Playoffs will be TMI TV presenters Sam and Mark, Casualty star James Redmond and national TV treasures Sooty & Sweep – with lots of surprise stars along the way. The tour will stop off at Welcome Break locations in Cardiff, Bristol, Birmingham, Keele, Leicester, Sheffield and Huddersfield. There’s bound to be a photographer in attendance. Disney has loads of money. Brilliant idea. Everyone should try this. Don’t know why we didn’t think of it before, it makes so much sense. If it was us, we’d urinate on the broken pieces to ensure nothing can be repaired afterwards. And get a woman to do the urinating, so more people on the internet want to watch the video. Hopefully the power of advertising will result in Sony’s installed user base mysteriously dropping over the coming weeks.